A new and versatile, crown ether appended, chiral supergelator has been designed and synthesized based on the bis-urea motif. The introduction of a stereogenic center improved its gelation ability significantly relative to its achiral analogue. 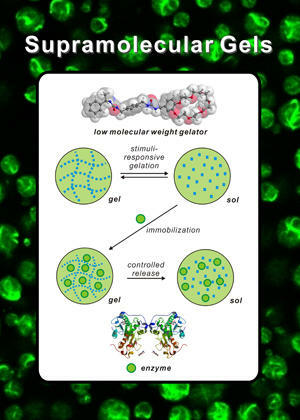 This low-molecular-weight gelator forms supramolecular gels in a variety of organic solvents. It is sensitive to multiple chemical stimuli and the sol–gel phase transitions can be reversibly triggered by host–guest interactions. The gel can be used to trap enzymes and release them on demand by chemical stimuli. It stabilizes the microparticles in Pickering emulsions so that enzyme-catalyzed organic reactions can take place in the polar phase inside the microparticles, the organic reactants diffusing through the biphasic interface from the surrounding organic phase. Because of the higher interface area between the organic and polar phases, enzyme activity is enhanced in comparison with simple biphasic systems.